Before we launch into the “It’s the Tuesday usual (but on a Wednesday)” direct your attention to the photo on the right. Yes, that one. The one with the writing all in caps. I know we all make mistakes. Heck, sometimes even I, a journalist of many years experience and hugely respected around my own home (mostly), makes the odd one in my writing (but just ignore them until nasty people constantly point one out then I shift my feet nervously a little, look to the ceiling and hope that they forget about it and go away) but after the Resident Evil Revelations typo on some 3DS boxes recently, I thought Capcom might have paid more attention to what gets printed on its boxes. It doesn’t look like it, if the photo of a review copy of Azura’s Wrath is anything to go by. 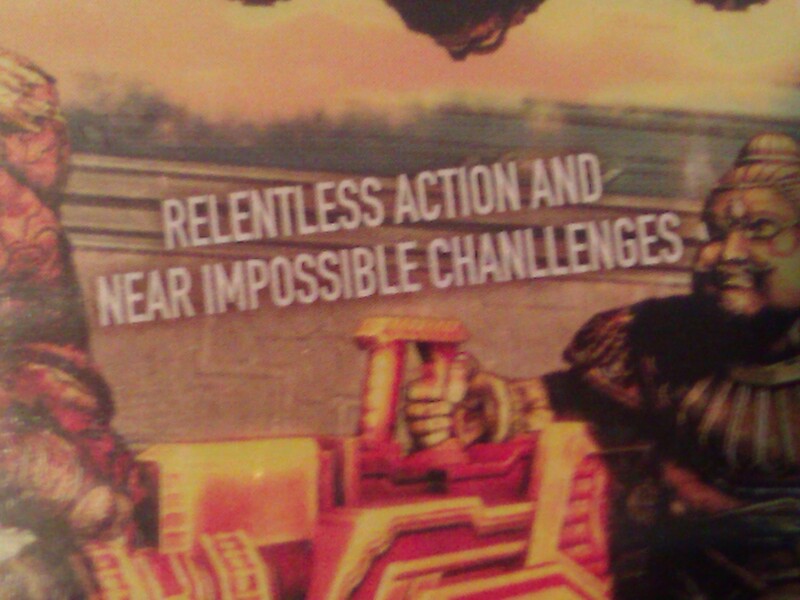 I took the photo after my 12-year-old son noticed this on the back of an Xbox 360 copy of the game: “RELENTLESS ACTION AND NEAR IMPOSSIBLE CHANLLENGES”. Impossible chanllenges? I guess they’re much harder than normal challenges. Anyway, I thought it was kind of funny. IMPOSSIBLE CHANLLENGES. OK, yesterday was Tuesday (but I’m filing this on a Wednesday as I attended a PS Vita launch in Auckland last night) and that’s the day I chat with Glenn “Wammo” Williams about games, games and more games. Yesterday, we chatted about Uncharted Golden Abyss, a launch title for Sony’s PS Vita which gets released in New Zealand tomorrow. Also, on Tuesday night I attended the New Zealand launch party of Sony PS Vita handheld, which goes on sale here tomorrow and tonight I downloaded some social networking apps for it (Four Square, Facebook and Twitter). The Twitter app is quite cool, and it’s incredibly easy to read on the big screen, but the one thing that bugged me was that it recorded that I’d made a tweet 59 minutes ago – but it was more like 59 seconds. Mmmm, not sure what’s going on there.